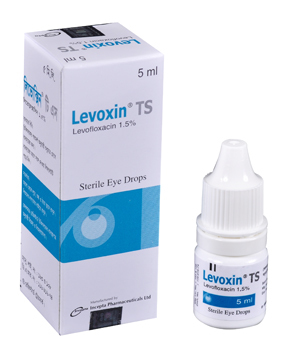 Levoxin TS Eye Drops: Each ml contains Levofloxacin Hemihydrate USP 15.37 mg equivalent to Levofloxacin 15 mg.
Levofloxacin is a synthetic, broad-spectrum, third generation fluoroquinolone antibacterial agent. It works by the inhibition of bacterial topoisomerase IV and DNA gyrase enzymes required for DNA replication, transcription, repair, and recombination. Corynebacterium species, Acinetobacter lwoffii, Staphylococcus aureus Haemophilus influenza, Staphylococcus epidermidis, Serratia marcescens, Streptococcus pneumonia, Streptococcus (Groups C/F), Streptococcus (Group G), Viridans group streptococci. Days 1 through 3: Instill one to two drops in the affected eye(s) every 30 minutes to 2 hours while awake and approximately 4 and 6 hours after retiring. Day 4 through treatment completion: Instill one to two drops in the affected eye(s) every 1 to 4 hours while awake. The most common side-effects are transient decreased vision, fever, headache, transient ocular burning, ocular pain or discomfort, pharyngitis, allergic reactions, lid edema, ocular dryness and ocular itching. This drug should not be injected subconjunctially, nor should it be introduced directly into the anterior chamber of the eye. Avoid contaminating the applicator tip with material from the eye, fingers or other source. Pregnancy Category C. There are no adequate and well-controlled studies of Levofloxacin in pregnant woman. It should be used during pregnancy only if the potential benefit justifies the potential risk to the fetus. Levofloxacin has not been measured in human milk. Caution should be exercised when Levofloxacin eye drops is administered to a nursing mother.